Three words that best describe Haramari are: Unique, Vibrant, Devoted. Haramari has been in the beauty and make-up industry since 2007. She has an artistic approach which is the foundation of her passion. She is a graduate of the Vidal Sassoon Academy and has gained much of her creative experience by participating in photo shoots, fashion shows and special events. She has received additional certifications in Brazilian blowouts, Keratin treatments, and hair extensions. She is always continuing her education so that she can keep up with the latest trends and always giving her guests new and exciting techniques. 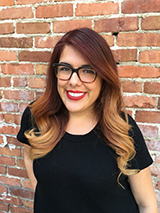 Through the Aveda color line and products, she can provide each guest with an individual cut and color cocktail to meet their specific needs, as well as educating them on how to maintain and style their looks at home. Haramari is a professional blend of unique characteristics, a vibrant personality and dedicated work ethics, with devotion to her guest’s satisfaction. Her work is eccentric with a contemporary spin on traditional hairstyles.